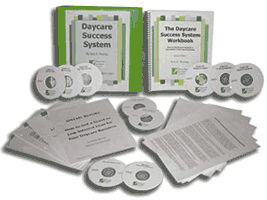 Discover how to start a daycare with the Daycare Success System. Opening a daycare is easy when you know the secrets, this proven system reveals how to start a home daycare. Click Here To Order The Digital Version Now! Looking for a way to become your own boss and stay home with your children! The key to having a profitable daycare business is knowing the right success secrets about enrollment, marketing, advertising, writing a business plan, getting grants to start your daycare, and how to properly manage your business. Avoid the most common pitfalls that many daycare owners make. 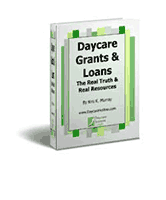 Make more money than the average daycare provider. Save hundreds of hours by using shortcuts the pros use. Get the maximum tax refund in your pocket. Face parents and kids with confident and know-how! You get all this and more inside the Daycare Success System! 8 HOURS of audio training, featuring 7 child care experts! Along with a comprehensive 157-page manual that takes you by the hand and literally FORCES you to be successful! Plus dozens of checklists and templates that will save you countless hours of time and frustration! The Daycare Success System Workbook. 157 pages of the most comprehensive daycare information, with a step-by-step approach to starting a daycare. Includes dozens of checklists & examples. The 2-Hour Audio Training Companion. Two hours of audio on CD or MP3 you can take anywhere, where I personally take you through the material to make sure you understand everything. Six Hours of Audio Training with Child Care Experts. Six hours of some of the most incredible daycare information ever recorded! You’ll hear secrets and success tips galore from these six daycare experts in topics such as insurance, taxes, how to set up your home, how to hire the best employees, and how to get customers. As an added bonus, the interviews have been transcribed so you can highlight key points and make notes on these calls. The Fast-Start Guide. A written guide that gives you the exact steps for using all this huge mountain of stuff, so you can get started quickly and easily. Daycare Forms on CD. 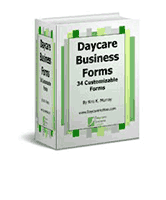 34 of the most-requested forms to run your daycare business, in MS Word, Excel and PDF formats. Simply open the forms & customize them as you need to, or use them just as they are. Having these daycare forms alone will save you dozens of hours of time! Let’s face it, there is no other product out there that is this complete. It’s nothing short of having a successful daycare in a box just waiting for you to open it. Physical version with the printed manual and all 10 CDs mailed directly to your door via USPS Priority Mail this includes the digital download version too. Both versions contain exactly same items; the only difference is how you receive them. With the electronic version you can download everything to your computer and start using it in minutes. When you order the physical shipped kit you get instant access to the downloadable version PLUS we will ship you the workbook, 8 audio CDs, a 2 CD-packet with daycare forms and bonuses, Fast-Start Guide, and the transcripts of the expert interviews. When your purchase is completed, with either format, you will receive an order confirmation email and instant access to download the entire system, regardless of the time of day…even if it’s 2 o’clock in the morning! No Shipping Charges and Instant Access Right Now! Click Here To Order Digital Version Now! Click Here To Order Shipped Version Now! We Accept Visa, Mastercard, American Express, Discover, or Pay By Check with E-Check. Credit Cards or Debit Cards Accepted. 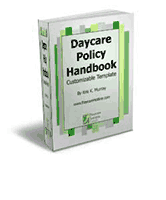 Daycare Policy Handbook you can use as is or update for your own needs. 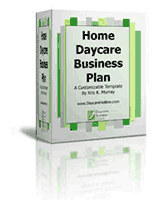 Business plan template for home based daycare. Just add your name and instantly you can have a business plan you can use. Daycare Center Business Plan template, just add your name and instantly you can have a business plan for you child care center. Every daycare forms you need. 34 of the most needed and requested daycare forms ready to use or modify for your own use.